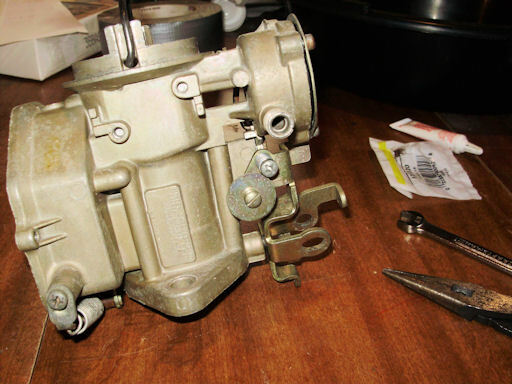 Install the gasket for the choke thermostat. Install the choke thermostat and retainer. 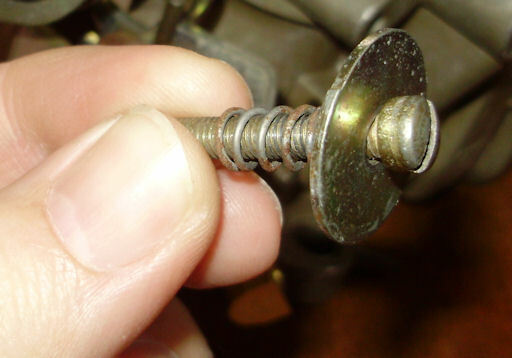 Do not fully tighten the retainer screws. A couple of notes about doing this. 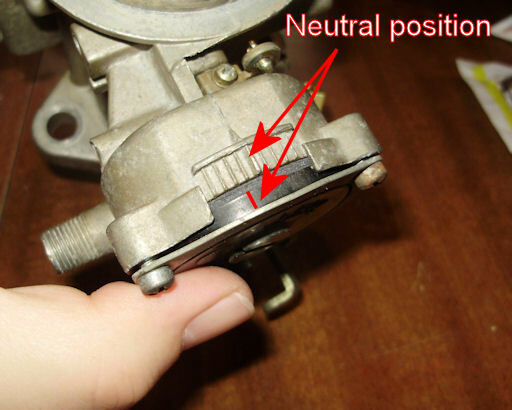 There is a tang on the choke thermostat spring that should be placed to the right of the lever (see second picture below) on the end of the choke rod. 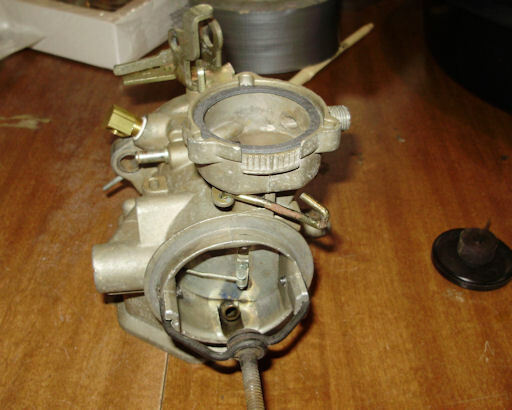 Check your TSM for the specifications for the choke thermostat. The big hash mark is the neutral mark for the thermostat. There is a mark on the thermostat that you use to adjust the choke richer (to the left) or leaner (to the right). The specification for Kermit is 1 notch rich. Tighten the retainer screws. Note: You may need to keep slight pressure on the thermostat to keep it in place until the screws are tightened. Install the fast idle cam and check for smooth operation. When you release the fast idle cam, the choke plate should snap shut. Install the curb and fast idle screws into the throttle lever. This is the curb idle screw. 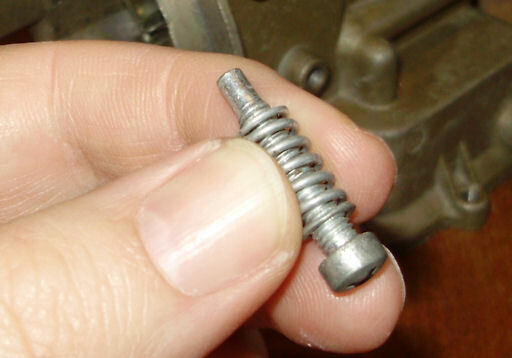 Note: This picture shows the wrong spring. 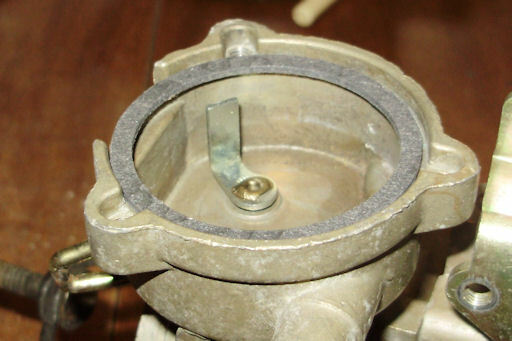 The spring shown is actually for the fuel mixture screw. 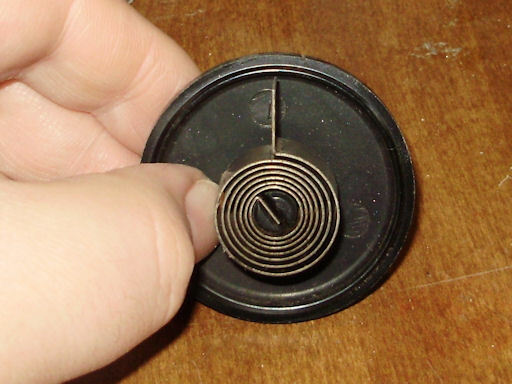 The correct spring is the heavier, brass colored spring. This is the fast idle screw. Besides being a different color, the threads are machined off of the end and it has a Philips head. This picture shows the screws in their proper position. 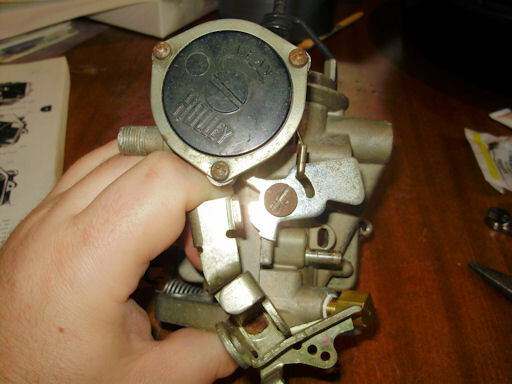 Turn the curb idle screw in until is makes contact with the carburetor body and then turn it several times to slightly open the throttle. Push up on the fast idle cam and turn the fast idle screw in until it makes contact. Place the screw on the second step of the cam and turn it in several more turns. These settings should be good enough to allow the car to idle.